Chocolate hazelnut spreads such as Nutella can be a delicious way to add variety to your sandwiches and baked goods. However, you might not want to give up on peanut butter just yet, since it has a number of advantages over chocolate hazelnut spreads when it comes to nutrition. You should consider these chocolate hazelnut spreads more of a treat than a go-to food, due to their high sugar content. A 2-tablespoon serving of chocolate-flavored hazelnut spread contains 200 calories, while the same amount of peanut butter only provides 188. Peanut butter also provides more protein, with 8 grams compared to 2 grams, and contains fewer carbohydrates, with 6 grams compared to 23 grams. The chocolate hazelnut spread is a bit lower in fat, with 11 grams compared to 16 grams in peanut butter. However, all but 3 grams of the fat in peanut butter come from healthy unsaturated fat. Peanut butter is a better source of vitamins than chocolate hazelnut spreads, since each 2-tablespoon serving provides you with 21 percent of the daily value for niacin and 14 percent of the DV for vitamin E and chocolate hazelnut spreads aren't a particularly good source for any vitamins. You need niacin for proper nervous system function, and turning the food you eat into energy, and vitamin E is an antioxidant important for forming new cells and immune function. Choosing peanut butter over chocolate hazelnut spread will make it easier for you to meet your recommended intake of minerals, as well. 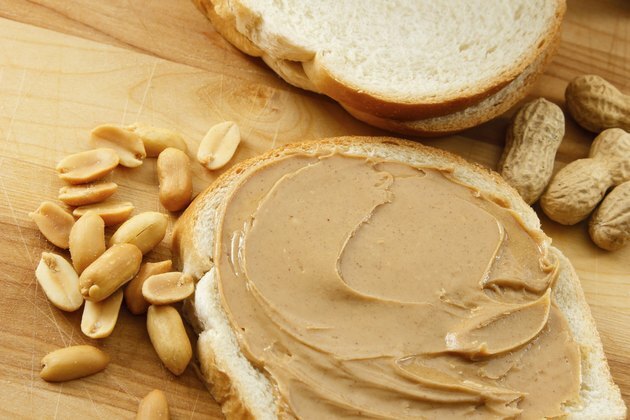 The spread doesn't contain very much of any of the essential minerals, but peanut butter provides 12 percent of the DVs for phosphorus and magnesium in every serving. Phosphorus is essential for muscle, nerve and kidney function, and you need magnesium for forming proteins and for regulating your blood sugar and blood pressure. Most Americans eat a lot more than the recommended amount of added sugar, which is no more than 100 calories, or 25 grams, per day for women and no more than 150 calories, or 37.5 grams, per day for men, according to the American Heart Association. Chocolate-flavored hazelnut spread contains 20 grams of sugar per serving, while peanut butter only contains 3 grams. What Are the Health Benefits of Nutella Hazelnut Spread? Is Eating Chocolate Bad While in Your First Trimester?